Normally, Unexpected Wildlife Refuge does not take in injured animals for rehabilitation because we do not have the necessary facilities or specialized staff. If you find an injured animal, we recommend you seek the services of a licensed wildlife rehabilitator. If you live in New Jersey, you can go to our Web site for a link to state-approved licensed rehabilitators (click here to access the list directly). But, sometimes we can help a neighbor in need without having to seek 'outside' help. I got a frantic call from a local woman who had purposefully trapped an opossum in her yard because she did not want the individual to be there. I rushed to her house to find the opossum had been in this small trap for more than 12 hours. It became evident that the opossum was nursing young. By educating the woman as to the harmlessness of the opossum and the need to allow the individual to seek her own habitat, I was able to convince the woman to release the opossum back to her yard. We both watched as the opossum ran to safety in a nearby tree. It is almost always best to not try to relocate wild animals (unless they are in imminent danger such as on a highway; see below) as this may result in injury or death. 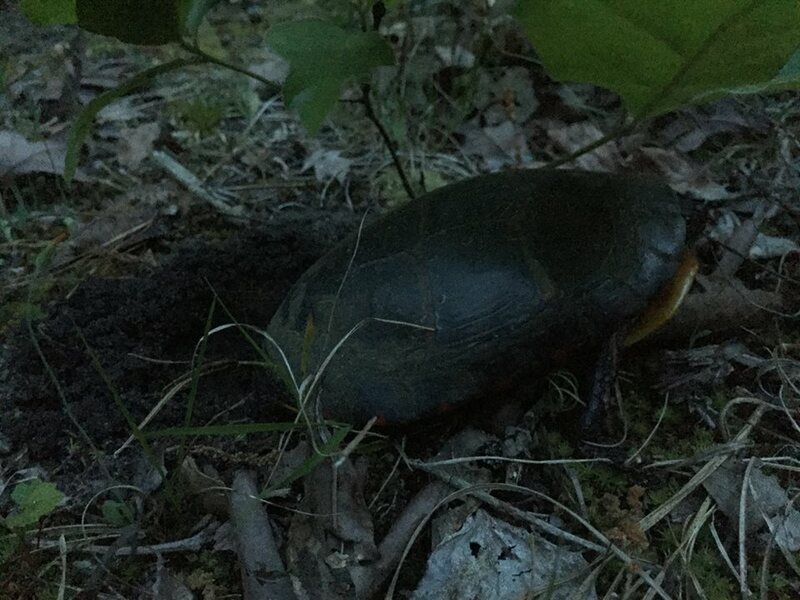 It was full twilight when I almost missed this charming little eastern painted turtle, Chrysemys picta picta (the second species name after the capitalized genus means this is a subspecies). When I bent down to photograph her, I discovered she was digging the nest where she will lay her eggs. What a moment! I walked very quietly away to prevent disturbing her at her evening's work. We have also seen dozens of turtles and tortoises in our driveway and on the roads. Just a reminder, you can stop and help a turtle or tortoise (or other similarly slow-moving individual) across a street. But, please bear in mind that they know where they were going. Be sure you place them on the side of the street to which they were heading or else they are likely to just end up in the street again. A small toad with a big call, this Fowler's toad ( Anaxyrus fowleri ) was spotted sunning himself on some sun-warmed stones. 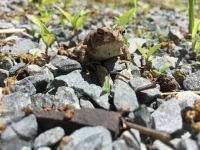 Previously considered part of the widely-encompassing Bufo (Latin for "toad") genus, the Fowler's toad has now been firmly placed into genus Anaxyrus with about 20 other toad species (of course, these are human-contrived names and classifications; we have no idea what the animals would think or if they even care).�They like to breed in vernal pools and in the shallower edges of lakes and ponds.�They are endangered in Canada and sensitive to habitat interference in the United States. 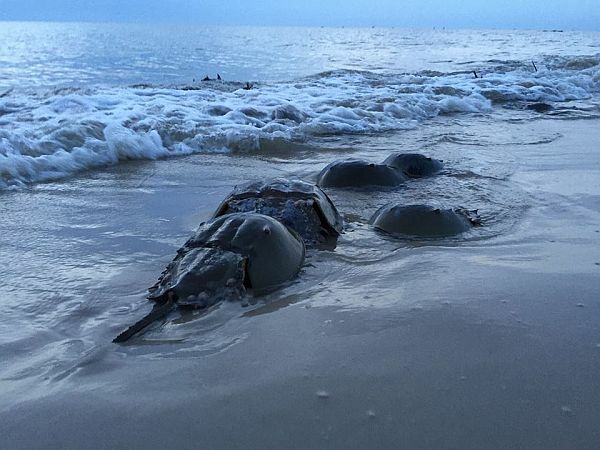 Every year between May and June, the sandy Atlantic beaches are visited by thousands of horseshoe crabs who climb ashore looking for mates and to lay their eggs in the sand. 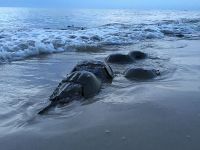 Due to climate changes, deposits and rubble from Hurricane Sandy, human detritus on the beach and other reasons, many horseshoe crabs become impinged, or stuck, flipped over and stranded high above the high-tide line. This year, Unexpected Wildlife Refuge has been working alongside reTURN the Favor, one of the groups that visit the shoreline, at dusk, and patrol miles of beach, righting overturned horseshoe crabs. We found three stuck under concrete rubble on one beach and it took almost 30 minutes to free them. These ancient little guys are essential to the ecosystem and we are grateful to be able to help free them from human impediments. We had a guest at Unexpected this week who helped us explore and discuss reasons behind the Refuge's remarkable biodiversity and geodiversity. Geographer Mark Demitroff studied and wrote about the local Ice Age (Pleistocene) era, the geological features of the Refuge and the surrounding Pine Barrens. According to Mark, "Unexpected's topography is remarkably complex. Its wonderful biodiversity can be attributed to the site's high geodiversity. Unexpected is also a location of scientific significance. Numerous papers were published on Unexpected's ancient cold non glacial (periglacial) features ... hundreds of geology buffs from around the world visited here on various excursions." Mark's opinion is that our beavers might even have Pleistocene roots, going back to a time when the landscape was cold, dry, and windy. 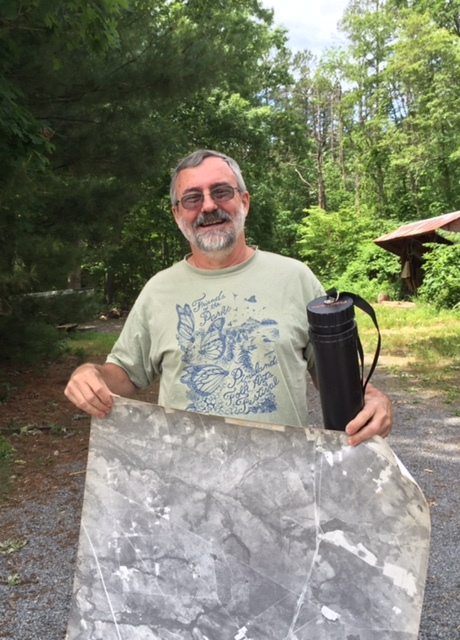 The photo shown is of Mark, holding a circa 1931 aerial map of our Marsh Lake Branch, during his visit to the Refuge to discuss our old, frozen dirt, ground that holds valuable terrestrial clues to abrupt past climate change. It was a very cool visit. Although you may be aware of our annual deer and other hunting season patrols and our Earth Day clean-up event, did you know that you can volunteer on Unexpected all year? 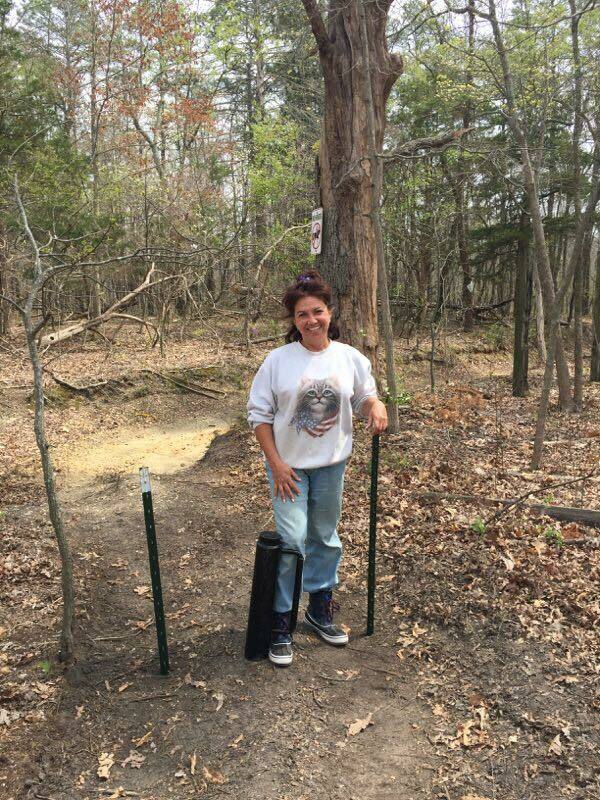 Volunteers like Mary Ann Gurka, shown here helping us install steel posts to prevent access by people on off-road vehicles, provide an invaluable service to the Refuge. If you live nearby or are visiting, or if you have a Boy or Girl Scout troop or graduating high school or college student who needs a capstone or service-learning project, consider helping us at the Refuge! Please email us at director@unexpectedwildliferefuge.org or call us at 856.697.3541 to volunteer for trail work, clean-ups, removing old barbed wire, making new signs or any of the other projects we have. Unexpected has grown from its humble 85-acre beginnings 55 years ago to nearly 800 protected acres today. This Refuge is home and sanctuary for hundreds of animal and plant species; many of the animal species have been here for generations, like the white-tailed deer shown here (the photo is blurry because she was 'caught' by one of our trail cameras). We depend entirely on the support of our donors; we do not have lucrative government grants because we would not allow the type of 'strings' attached to these that would force us to permit 'recreational' hunting, fishing or other exploitative activities. We  and the wildlife  could not exist without you. We know that you have limited resources and need to consider which of numerous worthwhile causes to support. We hope, however, that you can find it possible to give us a donation  today  of any amount. We desperately need your support right now. We care for these 767 acres with a very small operating budget and with a paid staff of one and a completely voluntary Council of Trustees. Despite this, even our small operating costs are exceeding our donations. We have many ways to give; see below for just some of your options or go to our Help Us page on our Web site for more. One of our current vital campaigns is to prevent off-road vehicle access to the trails on the Refuge. These vehicles, which are illegal on our Refuge, result in untold damage and death to animals and plants. If you would like to be part of the solution to this threat to the Refuge, please visit our GoFundMe page for more information.